All our partner sites are independently reviewed by our team of industry experts. We examine 10 different criteria and award a score out of 10 for each, adding up to a final mark out of 100. You can read a full description of our Lucky247 Casino review process here. Lucky247 Casino review received a score of 88/100. Lucky247 is in its 5th year of operation in 2017. Since its inception it has become hugely popular in Australia, and more recently has grown in popularity in the UK. It may not be on a par with some of the bigger names in the industry, but it still packs a punch on mobile and desktop and has a tasty game selection to keep gamblers of all shapes and sizes busy. For those who like to know a bit about the software behind their casinos, all you need to know here is that Lucky247 casino review is powered solely by Microgaming – one of the best-known software suppliers on the planet. What you get from Microgaming is a solid experience – years of operating casinos and devising new game formats means there are plenty of engaging slots and table games to choose from. What this casino lacks though, is the variety you get when you join those who pile on the mix of slots and live dealers from multiple suppliers from NetEnt to WMS. All in then, this is a nice brand, delivering good game quality, though a bit short on variety. And perhaps unsually for a Microgaming Casino, there are no Live Dealer games. The Lucky247 casino review bonus is reasonably competitive in today’s market – £500 in welcome bonuses, plus up to 50 Free Spins – but there are some steep conditions that come with it. All in your bonuses are subject to a hefty 40x wagering requirement, and a maximum withdrawal amount of 6x your deposit. You will also need to deposit at least £20 to qualify for any bonus. And finally, you only have 48 hours after your first deposit to claim your second and third deposit bonuses before they disappear. So, £500 is not a bad haul in all, just make sure you’re ready to meet those ts and cs if you choose to sign up at Lucky247. Now to the free spins. We love the fact that you’re not being presented with yet another Starburst free spins offer here. Instead, you get to try your luck on one of Microgaming’s favourite slot games, Tarzan slots. However, to receive 50 free spins you are required to deposit £100! You can also receive 10 free spins for depositing up to £30, 20 free spins for depositing up to £40, and 30 free spins for depositing up to £100. Further, your winnings from free spins must be turned over 40 times before a withdrawal can be made, and at that point your maximum withdrawal is £100. So, keep all this in mind when making your first deposits at Lucky247 – the offer is great, but the conditions are tough to meet. Happy Hours – Perhaps one for those who’ve had a few in the local on a Saturday Night! Between 10pm and 11pm you can get up to £500 in bonus cash into your account when you deposit £500 or more. You can also claim a 25% match for depositing up to £300. What’s Your Spin Flavour – free spins are dished out every Sunday to lucky players who have made a deposit during the week of £50 or more. Up to 100 free spins can be won in this special draw. Deal a Day – a special offer rewarding regular players with special bonuses and free spins for their gameplay. These offers are ‘personalised’ by Lucky247 which means you should receive free spins for your favourite games – a nice touch. Lucky247 promises a wide variety of offers, and the personalized rewards make good sense. So Lucky247 is an exclusively Microgaming Casino. You won’t find any of the classic NetEnt or IGT games here. However, you do get the very best from one of the finest game software companies around. Their best slots include Lost Vegas, Jungle Jim, Game of Thrones, Immortal Romance, Thunderstruck II and of course Tarzan. Plus, one of the original Progressive Jackpots, Mega Moolah. There are no less than 32 Blackjack Games and 8 Roulette Games too However, the big gap in the portfolio here is Live Dealer, which seems an odd omission for a casino that clearly wants to attract table game players. Nevertheless, you can still enjoy many happy hours with the quality slots and traditional table games through your mobile and tablet alongside a great PC version of the site. 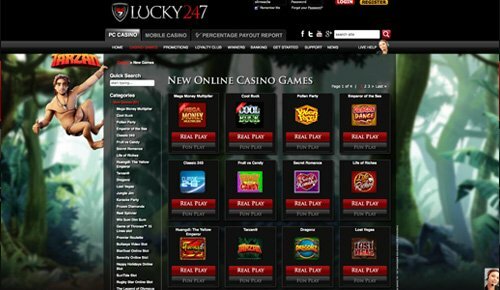 Lucky247 deliver well on customer support and are one of the few casinos to offer live support via Skype. You can also contact the casino 24/7 on live chat, email and telephone. Lucky247 have loaded up their cashier with the best payment methods available to customers in the UK. So, alongside your traditional debit and credit cards you also have the option to pay by Paypal, Skrill, Neteller, Ukash and Wire Transfer. The Lucky247 site is easy to navigate around, with a separate version for PC and mobile. There is an easily accessible table of game payouts, regulated by eCorga, which is a nice touch. There are also easy to use navigational tools that list all the available games down the left hand side of the screen to make things quick to find. The site is available on every device except for TV. So wherever you are, and whatever you are doing, you’ll be able to have a quick spin on the slots at Lucky247. A glaring omission in the Lucky247 game portfolio is the Live Dealer Suite. It is hugely surprising that a casino in 2017 would choose not to include these games. However, knowing Microgaming’s record in producing top quality software, we are sure they won’t be a long way off. Lucky247 is licensed and regulated by the Malta Gaming Commission as well as the UK Gambling Commission. * 18+, 40x wagering requirement before withdrawal (game weighting applies), max win conditions apply to bonuses, 2 day expiry for free spins, max bet 20% of bonus until wagering requirement completed, Ts and Cs apply. New Players only, Min Deposit £20.